Through coordinated observations with instruments on several ESA and NASA spacecraft and a collaborative analysis effort hosted by the International Space Science Institute (ISSI) an international team of scientists has compiled for the first time a consistent set of the physical parameters of helium in the very local interstellar gas cloud the surrounds the solar system. Careful analysis of data from three complementary observation methods produced a reliable set of physical parameters for the local cloud which can be used to model the interaction between the Sun and the surrounding interstellar gas and establish dimensions of the solar system. and scattering of solar UV light from the penetrating gas, which, until recently, was the only method for estimating these parameters. Knowledge of physical characteristics of extrasolar material, obtained with these local space measurements, represents an important step in our understanding the Sun's interaction with its immediate interstellar neighbourhood. The Sun is located in the outskirts of the Milky Way, about 30 000 light years from its centre, embedded in a fairly dilute and warm cloud of interstellar gas, which consists of a mixture of neutral and ionized gas or plasma. This cloud material represents a sample of today's interstellar matter in our Milky Way Galaxy from which stars and planetary systems form. In the case of the Sun and its planets this occurred about 4.5 billion years ago. Differences in the composition of these two samples of galactic matter tell the story of the evolution of matter in the galaxy as heavy elements are added by dying stars. The solar wind, which expands radially from the Sun at supersonic speed, blows a cavity - the heliosphere - into the surrounding interstellar cloud, filling it with solar material and magnetic field. The plasma component of the interstellar gas is kept outside the heliosphere. By balancing the solar wind ram pressure, which is easily measured, against the pressure of the surrounding cloud, the size and shape of the heliosphere is determined. With the new consensus set of interstellar helium parameters, its density, temperature, flow direction and speed relative to the Sun, the interstellar pressure can now be computed more reliably and the roughly 100 AU size of the heliosphere more accurately determined. Because the Sun's motion relative to the surrounding gas, an interstellar breeze of neutral atoms blows through the heliosphere, very much like the wind felt when driving an open car. Only very close to the Sun is the neutral gas ionized by the Sun's UV light and the by the solar wind, which leads to a small cavity in the neutral gas, roughly of several AU in size. Except for hydrogen, which is affected by radiation pressure, the Sun's gravity deflects the neutral gas flow, leading to a concentration of neutral gas density in the direction opposite to inflow direction of the gas. 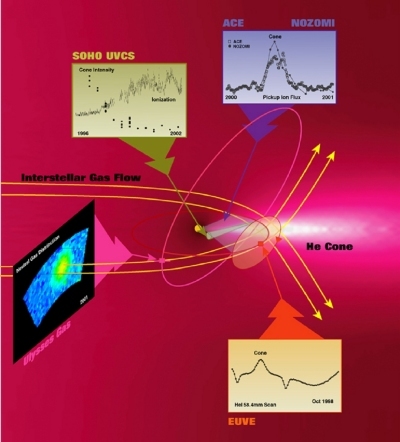 Figure 1: Interstellar flow in the inner heliosphere, locations of observations, and inserts depicting the observations. The resulting flow pattern is shown in Figure 1 for helium. It is this flow pattern that is analyzed to derive the flow speed, its direction, and temperature. Helium, the second most abundant element after hydrogen, distinguishes itself by infiltrating closest to the Sun, to distances even inside the Earth's orbit. Furthermore, because its density, temperature, and speed are not affected by processes at the heliospheric boundary, analysis of the properties of the helium gas inside the heliosphere allows one to establish the state of the pristine interstellar medium. 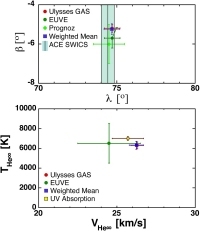 The GAS instrument on the ESA/NASA Ulysses spacecraft collects images of the He gas flow (coloured insert), whose observed deflection by the Sun's gravity is translated into the flow conditions outside the heliosphere. NASA's EUVE has repeatedly scanned the focusing cone in the light of the He line at 58.4 nm as illuminated by the Sun (yellow insert). The SWICS instrument on NASA's ACE spacecraft and on Ulysses collects He ions that are created inside the spacecraft orbit from the interstellar gas and then transported outward with the solar wind. The blue insert shows the pickup ion flux as the Earth passed the He cone in December 2000. UVCS on the ESA/NASA SOHO spacecraft observes the cone intensity at 0.2 - 0.5 AU in the He 58.4 nm line, as the first coronagraph that ever observed the interstellar gas. The green insert shows how the cone intensity decreases from 1996 (solar activity minimum) to 2000 (solar maximum) as the ionization, monitored with the CELIAS SEM sensor on SOHO, increases. Figure 2: Flow direction in longitude and latitude as obtained by the different methods along with weighted mean (upper panel). Flow speed and temperature from the different methods and compared with astronomical observations (lower panel). Figure 2 shows a compilation of the observations along with weighted mean values from all available observations. The upper panel shows the flow direction, and the lower panel contains the flow speed and temperature. It is evident that the direct observation of the neutral atoms provides the flow characteristics with the least uncertainty. A comparison with speed and temperature obtained through absorption of star light averaged over several light years indicates that these values appear to be typical for the entire cloud, for which other observations show that the Sun is located close to its edge. The He density has been established to be 0.0151±0.015 cm-3 (Ulysses SWICS), 0.015±0.03 cm-3 (Ulysses GAS), 0.013±0.03 cm-3 (EUVE), with the pickup ions providing the smallest uncertainty. Together with the recent observations by Voyager 1, indicating that this pioneering spacecraft is close to the termination shock or may have even crossed it temporarily (the termination shock is the boundary where the solar wind is quickly decelerated to subsonic speed) this consistent and accurate set of parameters is now beginning to provide strong constraints on models that describe the size and structure of the heliosphere. A new team hosted by ISSI has started to extend this effort to hydrogen, a more complex task because about half of the hydrogen atoms do not penetrate the outer boundary of our solar system, which strongly affects their flow. (1) Dept. of Physics and Space Science Center, University of New Hampshire, Durham, NH 03824, U.S.A.
Synopsis of the interstellar He parameters from combined neutral gas, pickup ion and UV scattering observations and related consequences, by E. Möbius, M. Bzowski, S. Chalov, H.-J. Fahr, G. Gloeckler, V. Izmodenov, R. Kallenbach, R. Lallement, D. McMullin, H. Noda, M. Oka, A. Pauluhn, J. Raymond, D. Rucinski, R. Skoug, T. Terasawa, W. Thompson, J. Vallerga, R. von Steiger, and M. Witte.